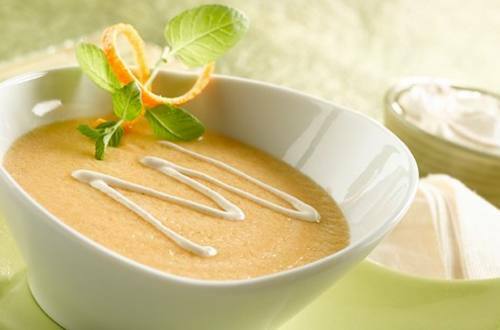 Treat yourself to our Cantaloupe Soup With Chipotle Cream. It's a soup recipe that is seemingly sweet, but then surprises you with a touch of hot Chipotle for a truly unique taste. 1 Process first 4 ingredients in blender, in batches, until smooth. Chill about 1 hour or until ready to serve. 2 Meanwhile, combine remaining ingredients in a small bowl; chill until ready to serve. Serve chilled soup topped with chipotle mixture.